Bright colors of the Atala butterfly warn predators not to take a bite. With Maryland finally in the grip of Old Man Winter, the time is right to get out of town, dream about the upcoming spring, and visit bugs in tropical places. Our first stop on this global sojourn is southeastern Florida, home of the coontie and the gorgeous Atala butterfly. Widespread planting of cycads in landscapes may support the return of the Atala in Florida. Coontie is the local name for the curious plant, Zamia pumila, a native of the sunshine state. Zamia belongs to a large group of ancient plants known as cycads that harken back to the time of dinosaurs. After millions of years battling herbivores, Zamia and other cycads evolved toxic compounds known as azoglucosides to defend themselves from hungry hordes intent on eating their leaves. 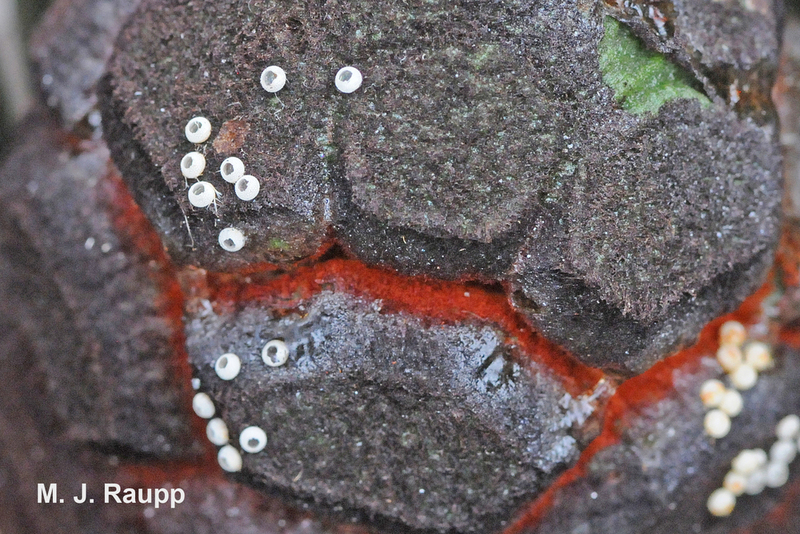 Hatched eggs of the Atala festoon the coontie's cones. Ah, but like the clever monarch butterflies we visited on August 15, 2011, in “Return of the royals - the monarch butterfly, Danaus plexippus.”, and the milkweed longhorned beetle, Tetaopes, and the dogbane leaf beetle, Chrysocus, that we met on July 18, 2011, one of the denizens of the coontie has bested its chemical arsenal. Larvae of the Atala butterfly eat the leaves of the toxic cycad and store the noxious compounds which, in turn, are passed along to the adult butterfly. Atala caterpillars are said to have an unpleasant odor and the chrysalis, or pupal case, is protected by small drops of nasty fluid. 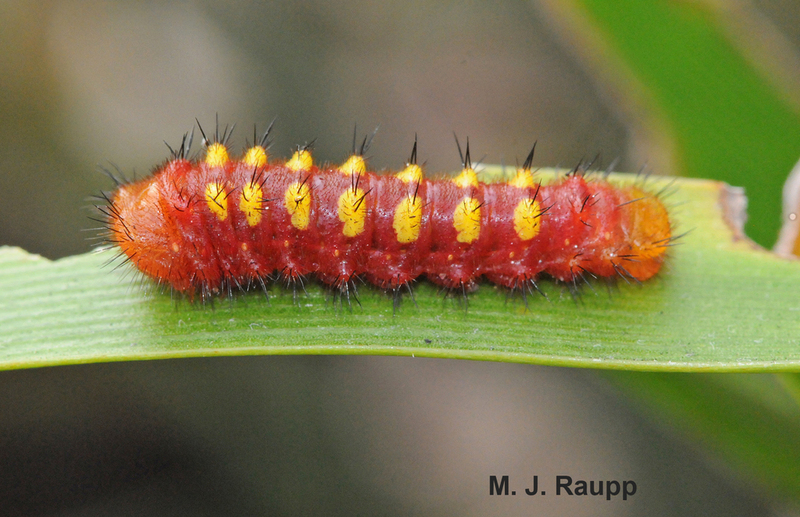 The Atala caterpillar stores noxious chemicals as it eats the leaves of the coontie. The spectacular coloration of the caterpillar and butterfly serves as a warning to predators such as hungry birds not to risk an attack lest they suffer the consequences of a toxic meal. Aposematic, or warning coloration, is the name of this game and it is widely practiced by many species of butterflies, moths, beetles, flies, and stinging insects such as bees, wasps, and hornets. 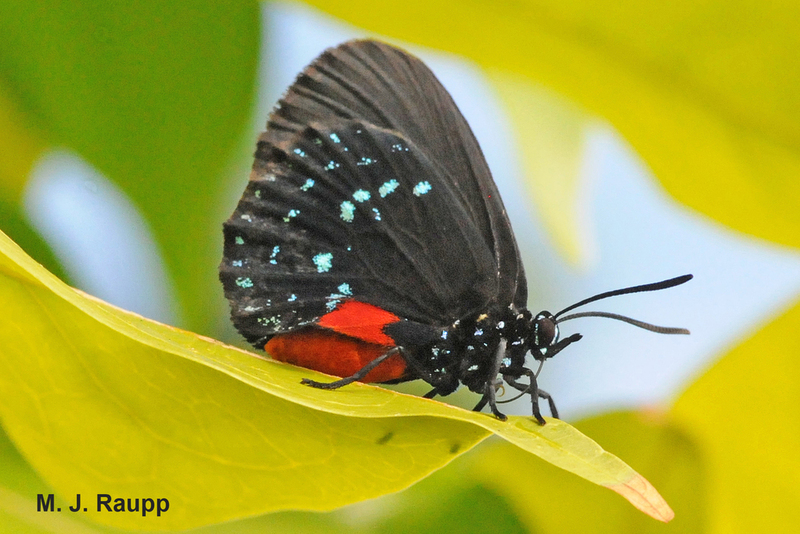 In a time when urbanization threatens many native insect species, there is some good news for the Atala butterfly in Florida. It seems the widespread planting of coontie and other cycads in residential landscapes has provided a bounty of hosts for this relatively rare butterfly and some reports indicate that this urban adapter has become more abundant in recent years. We thank the intrepid Dr. Shrewsbury for discovering the subjects for this episode of Bug of the Week. The remarkable references “Caterpillars of Eastern North America” by David Wagner; “Cycads: their evolution, toxins, herbivores and insect pollinators” by Dietrich Schneider, Michael Wink, Frank Sporer and Philip Louniboshearty; and “Florida Coonties and Atala Butterflies” by Daniel F. Culbert were used to prepare this story.